Greetings that make me smile: When you walk in the door after a long day, Jack’s always glad to see you. He doesn’t worry about tomorrow, he’s not bitter that we left him today and he doesn’t care how successful the day was or wasn’t, he only cares that we’re home. We could learn alot about unconditional love and happiness from him. Let’s play: Trying to work tonight and Jack won’t let me. I now have 3 tennis balls, 2 chew toys and other stuff at my feet. It’s as if he saying, dad, Dad, DAD, DAAAAD, come on Dad, throw me the ball, please dad will ya, huh, will ya? Time to give in, he’s got a tennis ball in his mouth, one front leg on my lap and he’s grabbing my arm with his other front leg. Dogs, one of God’s best gifts (Some other great gifts… bacon & peanut butter). 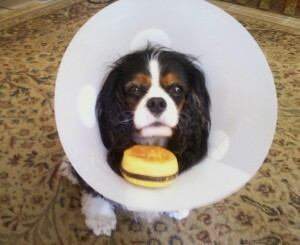 Adversity: A few weeks ago my dog Jack’s eyes were seriously damaged. He’s been to multiple vet appointments, even seeing a doggy ophthalmologist. Despite the problems, he still enjoys life and has adapted well to his adversity. This huge cone makes picking up toys much more difficult but it has not stopped him from playing. Now he just runs across the room and uses the cone as a shovel as he traps the toys against the wall. Maybe he has a life lesson for all of us to learn: Always find a way to play despite adversity and challenges. For those concerned: His eyes are healing up nicely.